At Gardeners’ Guild, the San Francisco Bay Area’s premier Landscape Management Company, safety is more than a first-aid kit and a few fire extinguishers. GGI takes safety seriously, and truly cares about the welfare of its more than 150 employee-owners, whose motto is “Safety is our Culture”. 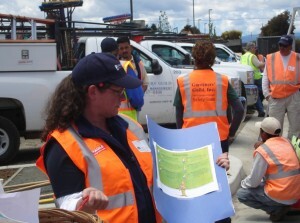 On Wednesday, May 18, all 150 of us converged on the grounds of the GGI Richmond headquarters to participate in the company’s 8th Safety Jamboree, a yearly training event focused on equipment safety protocols. The action-packed event kicked off with a succulent feast of traditional Mexican fare including tangy and tender barbequed carne-asada, chicken, home-made rice and beans, warm corn tortillas and a salsa bar with three different kinds of freshly made salsa that would put even the best Mexican taqueria to shame. 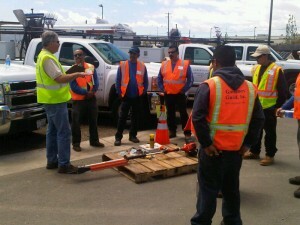 Following the food fiesta, the 2011 Safety Jamboree training-event began with a few words by GGI President Kevin Davis, who commended the staff for a nearly perfect safety record for this year. This is a testament to our rigorous safety policy and procedures, and it made our insurance company happy. Mowers, and Blowers, and Chainsaws – oh my. The jubilant jamboree continued as landscape professionals, decked out in bright orange safety vests hats broke into small groups where they toured the yard, learning proper operating procedures and safety recommendations on the inherently dangerous heavy and not-so-heavy equipment used. 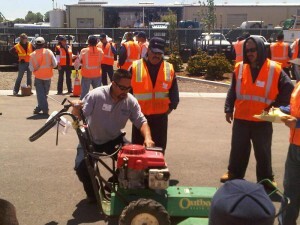 GGI experts manned the stations to demonstrate the operating procedures and safety protocols of Rider Mowers, Walk-behind Mowers, Standard Mowers, High-weed mowers, Aerators, Chainsaws, Hand Tools, Weed-Eaters, Stick Edger’s, Gas-powered shears, and Power Blowers. At 10 minute intervals, a horn would signal time to move on to the next station. You could say that when you hear a horn blow at GGI, a gardener has gotten his or her wings. The event wrapped up with everyone gathered around the Safety sign as company President, once again took the stage, applauding the staff on another successful and enjoyable GGI event. He also honored some long time employee-owners with a plaque commemorating their length of service with GGI. Well done, GGI!